When we started a mission organization in 1853, it was called the Home, Frontier, and Foreign Missionary Society. Rev. Israel Sloane pulled a trifecta. Before his tragic death at age 39 on August 31, 1863, he served in all three realms–the home front, the frontier, and in a foreign country. But not in that order. Sloane started out as a United Brethren minister in southern Ohio. 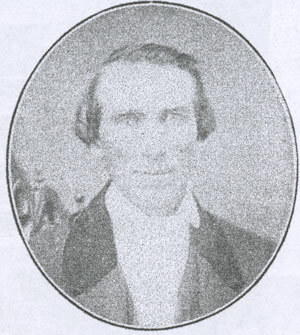 In October 1854, the Board of Missions sent him as a missionary to Canada. A non-UB minister named John Cornell (from the Cornell University family), who had been a minister in Ontario for over 40 years, was retiring and wanted to bring his churches under the United Brethren umbrella. Sloane became pastor of Cornell’s church in Sheffield, Ontario. Soon, several other ministers came up from the States. In 1856, Bishop Jacob Glossbrenner organized the Canada Mission Conference with seven organized churches, 18 preaching points, nine licensed ministers, and 152 members. Growth came quickly. By 1863, membership had hit 1000. But Israel Sloane stuck around for just four years. In 1858, the Board of Missions sent him to California. Sloane and his family traveled by ship from New York to San Francisco (it took 24 days), and rode a steamer up a river to Sacramento. Before leaving New York, Sloane wrote a letter to the editor of the denominational publication, The Religious Telescope. That’s how he saw himself—as a missionary. He had done the Home (Ohio) and Foreign (Canada) parts. Now he was off to the Frontier (California). Three months later, Sloane was the single father of three kids; his wife died on March 2, 1859, of tuberculosis. But in May 1860, after an eight-week trip to the East, he returned to California with a new wife. The work continued to expand, with Sloane leading the way. In 1861, he had the joy of seeing the 1861 General Conference organize the California Mission Conference. First Canada, now California. On June 23, 1863, Sloane began the journey to visit some troubled churches in the Sacramento Valley. He spent one night at a home near Knoxville. He put his horse in the coral with a mustang, which proceeded to kick his horse in the leg, breaking it. Another horse was available. He had misgivings about it, but was assured the horse would be safe to ride. As he descended the Cache Creek Mountains, the horse began running down the steep grade. Sloane couldn’t stop the horse, and couldn’t jump off, lest he tumble down a precipice. He was thrown at the bottom of the hill, where he was eventually found, seriously injured. He was taken 35 miles to a home, where he spent the next three weeks recovering from his injuries. He then continued on to the Sacramento Valley. But he was not well. His new wife was worried when he didn’t arrive back when expected. Had Indians got him (there were stories of ministers dodging arrows during their trips)? Had he tangled with highwaymen, as often happened? She finally received a letter from Israel saying he was coming home…but he didn’t come. He sent another letter on August 1, saying he would start the return journey on August 6. But she waited in vain. He never mentioned his physical problems. Around midnight on August 30, a rider approached the home and knocked on the door. He told Mrs. Sloane that her husband had arrived in Eureka on a steamboat, sick and near death, and had been carried into a hotel. She reached his side at 4 a.m., and was with him when he died shortly thereafter. The work in California was sorely lacking in workers, and now they had lost their leader. Some voices suggested we pull out and leave California to the many other churches ministering there. But Bishop Daniel Shuck, who had pastored for four years in California, disagreed. During a six-month visit to California during the spring and summer of 1864, he rallied and revived the demoralized church. He discovered that many people were attracted to the United Brethren positions against slavery and freemasonry, and didn’t feel comfortable in other churches which had made room for both.